7.5 Months and feeling great ..even with a skinny calf! Just thought after all the great advice and support this blog provided during those dark early days, I would check back in and write a quick update. It has been approximately 7.5 months and I am almost back to normal. I say almost because my calf muscle is still struggling to get back to its original size. I don’t notice any daily effects however, if I try to do the 3X25 single heel raises the last two sets are very tough. The bike riding, tennis and even short sprints are all 90% there. The hard part is remembering to do the heel raises as my daily functioning is very close to where i was pre surgery. The good news is all my post tennis pain ( i had a bone spur that developed and was the cause of the rupture) has gone. After 10 years I am free of pain after tennis! YAHOO! to all of you on the blog don’t stress to much. It really is a year long recover, but at 5 months I was hiking in the mountains and not even noticing the injury. Stick with and best to all. Wow….. 4 months seemed so far away when this journey started. Now it seems like life is back to semi normal and I can start to concentrate on the usual stuff. For those who are in the early stages of the POST Surgery phase I thought I would do a brief timeline of my recovery as this was something I wanted to see when I was early on. It helps to understand how once you get the cast off life and return to a nice pattern if you remain positive. Happy recoveries to all…..before you know I am sure we will have forgotten we had the surgery! This is to hard to believe, but 3 months after my ATR July 17th, 2011) my wife has just ruptured hers! Besides being hard to believe and crazy weird, we are really trying to understand if there is some common element that lead to the ruptures. She plays tennis as do I, so very likely this is the reason BUT she is not that explosive and was very warm up and well stretched. We both had sore Achilles treated by the ESWT 2-4 months prior to the tears. I know there is a relationship between Cipro and other fluoroquinoloneas (we did not take any) has anyone ever heard of a relationship between ESWT and ATR’S? Has anyone ever heard of a relationship between ESWT and ATR? Very excited at 12 weeks…..free to roam! I just wanted to post to say how excited I was today when the Dr. gave me clearance to roam about the world free healing and sans shoes. Goodbye heel lifts and hello Birkenstocks! 12 weeks post-surgery seems like a re-birth! To celebrate I went on a 45 min bike ride and enjoyed the beautiful sunny 65 degree day. So a big thanks to this blog as it really is a great source of support and help to getting through this lengthy rehab. It seems like only yesterday that I had the surgery and I really feel like I have turned a corner and can see a normal existence in the not too distant future. The surgery was for a: Full Achilles rupture and a bone spur removal that involved a detachment of the tendon at the heel and 3 screws to reattach the tendon once the spur was removed. For those of you just starting the process I do recommend utilizing this site for rehab protocol and any questions that arise. My current rehab is going well. I can do 7 single heel raises and the swelling of the heel is not bad. I walk 30-40 min a day and the ride today actually felt okay. No hills yet, but in a few weeks I’ll start working on those. My calf was measured as only .5cm less than my “good” leg so the Dr. says that is functionally normal. All the best to everyone, and thanks again. Incision slow to heal…..any sugestions? I have a 1 inch section of the incision that just does not want to join together. The subcutaneous part is all closed, no infection or anything. Anyone else get this? I figured it was because the foot sweats in the boot so I cut the boot foam open. Seems to be slowly getting better, but it is aggravating..On week 9! any comments would be interesting. thanks! can’t wait for the shoes…..YAHOO! Down to no Lifts in boot…some tingling? Well its week 8 and the DR said only 2 more weeks (i had a bone spur shaved in addition to the ATR) of the boot. I took out the lift that was in the boot (Dr’s okay) and notice that there was a slight tingle on the heel at the end of the day. I suspect the tendon is being stretched a little further, but thought i would ask if anyone else experienced this. My ATR surgery also involved a detachment and reattachment of the AT at the heel bone. I had a large bone spur shaved off in addition to the ATR surgery. The incision is healing fairly well (at week 6) but my heel is “warm” and slightly tender at the lower part of of the incision where the heel / bone spur work was done. has anyone else experienced this ? Sleeping with boot off? When? Also, did any of you get a sore heel from the boot? Seems crazy, but I had my cast taken off on August 11th and yesterday to my surprise I suddenly found myself walking without crutches! The cast came off Thursday 8/11 and I was NWB for 6 days. I went back to the Dr. on Wed 17th to have him look at the incision ( thought it was opening up which it wasn’t) and was told i was clear to PWB and that over the next 2 week I would get to FWB. Well here I am 3 days later and pretty easily able to FWB in ROBO Boot and an “Evenup” on the other foot. I am going to take it super easy (may still use a crutch periodically) as I don’t want to rush things. It just seems quick to me…. I wanted to start by saying thanks for the site…. Tore my Achilles July 17th, Surgery 21st. Aug 11th cast came off! Had a large bone spur that caused the tear. So in addition to the Tendon repair they shave the spur. This added somewhat to the surgery as they had to reattach the tendon at the heel after the spur was removed. It’s been a 10 year issue. But the good news is one more week of NWB and the Dr said I can move to FWB using crutches. I have been using the Knee Up scooter. WOW this thing is great. Get one (rent) if you can! Dr. said after after next week i can go to PWB and then it should take 2 more weeks to be FWB no crutches. Started the ROM exercise yesterday and wow did it feel “exposed” at first. Did the side to side ROM and some Alphabet stuff. Certainly don’t want anyone around (especially the dog) when the boot is off! Anyway, slow but steady progress. I am in the gym every day (really helps the mood) and yesterday started riding the stationary bike with the boot on the 2nd pedal. I have been riding with one leg for 3 weeks. Breaks a good sweat. Upper body and core are easy to do. Just remember NWB…. 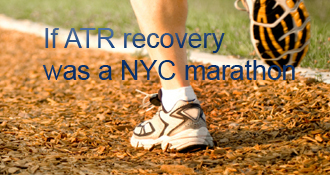 peterc has completed the grueling 26.2 ATR miles to full recovery! I had read a case study that O+ blood types were more prone then others. i also had ESWT on both of my feet and have now ruptured both of my achilles tendons. i also wonder if the ESWT has contributed to my ruptures. I started one blog page with a title like “This swelling is really getting OLD!” I forget how far “in” I was, but I bet it was MORE than 16 weeks. The good news is that the swelling resolved fairly soon afterwards. So start your own blog! Wearing compression socks helps lots of people, too. I am now 16 weeks post-op. I did six weeks in the cast and approximately 8 weeks in the boot with the last two weeks using the boot for only outside. I had a 90% tear doing box jumps. I had surgery on Nov15 and the injury happened on Nov 8 th. I am now in the gym doing upper body and modified lower body. I was told to use the machines only and no free weights. I am allowed to do spinning but no standing on the bike. The biggest problem I am having at the moment is the swelling daily. I am not sure if this normal for everyone. I do all my exercises, calf raises, one-legged balancing etc. Does anyone experience a great deal of swelling? I am icing and elevating my leg. I am also planning to try the Alter G treadmill to see if this will speed up my recovery. Justin, there are several other people who’ve checked in here after having their AT cut, one by a sheet of glass, one by a screen door, etc.The good news is that you’re at no unusual risk of injuring the other one — unless you’re a habitual drunk or distracted or lousy driver, of course! The rest of us, who had ATRs, are at relatively high risk of rupturing the other AT. At 8 months, you should be able to do any exercises you like. A PT should help, or a trainer, or just look online for calf and ankle exercises. Stretches, heel raises, bicycling with lots of ankle flexion, working on gym machines, etc. If it feels like it’s “working” your calf and AT and ankle, it probably is. . . I didn’t rupture my Achilles. Mine was cut, I was in a car wreck and something cut it. But I’m going on 8 months, any certain exercises I can do or anything to stretch the Achilles and/or get more mobility in that leg ? At 7 months, I experienced my third ATR in the same tendon… Putting me into a very comprehensive surgery and dealing with some serious stress in my “good leg” like housemusic. Now that I’m three months post-op, my time line finally seems manageable, as does my personal stress level. As I approach the year anniversary of my first ATR, I’m left with a lot to think about…. Good luck with your skinny calf and thanks for a positive post! Going on six months here, and having some issues with “the other tendon”…I am very happy to hear you have gained your life back, nevermind that skinny leg! Sounds good! If I’m hiking trails at the five month mark, I’ll call that a victory for certain. Best with your tennis game, and other activities. Thanks Peter! To me, that sounds like you are doing incredibly well. You’re 5 or 6 weeks in front of me, and it’’s really helpful to have some guidance- to know what to aim for / expect. 145 single heel raises daily, at 16 weeks! Wow!! Leaves me wondering: when did you find yourself first able to do a single heel raise? That is what we are trying to figure out. It is very strange for husband and wife to have ATR in the same short period. My belief is Tennis most likely. Mine was from 10 years of over use and hers was likely from tennis, Running the hills where we live etc. We both did ESWT as an attempt to cure the Achillies tendonitis we had developed as other methods had not worked. What i find most interesting is her tear occurred within 2 months of the ESWT. Makes me wonder if it weakens the tendon signoficanlty. Nothing on the web indicating this BUT…..
I’d also be asking: why were you both needing ESWT? Why did you both have sore Achilles? Is there some common root cause (besides tennis) going even farther back? The good news is my PT was proactive and applied a simple Butterfly bandaid. Over the last 3 days It seems to be working. We had the surgeon on the phone and he did mention the possability of a subcutaneous stitch floating upward and didnt seemed concerned…. I had this problem until about a week ago (7 1/2 weeks). It had been going on for a number of weeks and then finally a piece of suture came out after I had a shower. Incision began closing and then seemed to flare up again and a small piece of suture came out. Now (a weeks since the last piece came out), it’s all sealed up and feeling much better. Unfortunately, until the suture came out there wasn’t much I could do but wash it daily and cover it with polysporin and a bandaid. I believe heat is from blood (or something else) healing the area. Sorry I can’t be more specific, it was something I read a while back and I may be wrong. What I can say for certain is my op area is permanently warm and has been for 8 weeks now. I had a similiar surgery - I had almost a full rupture but what happened was the part of the tendon that did not tear actually came off the bone. My bone stuck out further down there so they had to shave it down as well to reattach it. I’m 6 weeks out of surgery and mine does feel a little warm to the touch as well and tender but I think that’s just normal. Mine was usually like that before I had the surgery too cause I’ve always had problems with it. I would not worry about - I am sure it’s fine…unless you have issues where it’s uncomfortable. I started sleeping without the boot around week 6. I am at week 8 now (non-operative), I am still in the boot for a few more weeks but I have stopped wearing it while I sleep. The doctor says, the toes will point down naturally at night, but if I do sleep without the boot, make sure to move the ankle around to loosen it up before putting it back in the 90 degree boot. I’ve followed all the doctor’s directions and I have had no issues. As far as the heel soreness, I have that too. I will have my follow-up with the doctor in 1 week so, I’ll be addressing that. I wish you the best in your recovery. 6/7 week mark was when I went without boot. Even with a gel pad still got some heel pain so I decided to ditch the boot after taking it off a couple of times at 4am and being OK. I wanna say I slept without boot around 6 weeks as well. Main thing is that when you sleep bootless your foot will naturally rest at about an angle with the toe pointed down, therefore over night your tendon will tighten up quite a bit. My dr said as long as I had no problems getting my foot back into the 90 degree position in the boot every morning he had no problem with me sleeping bootless. Hopefully you don’t sleep walk! that wouldn’t be good! Hi PC. I think I was given the all clear for no boot in bed around 6 weeks since the start of treatment. I didn’t have surgery so suspect my consultant a bit more cautious about being boot free in bed. The downside to no boot in bed was my partner moaning about the noise of the velcro straps when putting the boot back on in the middle of the night to use the washroom!! How selfish!! Sore heel, yes me too. I purchased a gel heel protection from a local sport store for a few pounds. It worked for me. Enjoy your new bed freedom. I kicked my good ankle with my boot so many times whilst sleeping. No boot = better sleep and a bruise-free good leg. I know the feeling. I went the extremely conservative route and waited until I lost the boot completely to sleep without it. That was probably around 8 weeks or so. I didn’t want to take any chances since 5 weeks is still pretty early and you are in the protection phase. Massaging the calf won’t do anything for strength but it will help to keep things loose and helps with blood flow. The stationary bike is probably your best friend at the moment. I’m not sure how much it helps with the calf atrophy while it is locked up in the boot but it certainly helps other muscles that will come into play as you walk more. Some people get strength back comparitively fast and others take longer so it will be a wait and see with you. Thanks for the comments. I am definitely in the boot and have no aspirations of getting “out of jail” for another 6 weeks. I had a heel bone spur shaved off in addition to the repair so I also have 3 screws healing in the bone. Very nice to be “mobile” compared to the knee scooter. icing is a 3x daily routine and the chez lounge and wireless is my new way of life. thank goodness I can work from home like this! I saw some video where someone spent a lot of time massaging his calf. Is this a way of rebuilding the strength? I ride the stationary bike daily (boot on) so this has helped with the calf atrophy. Thanks again….. Plenty of recent studies suggest early weight bearing is best. And nope, doesn’t seem too fast to me. Check out the atr tracker on the site (look for it in the left sidebar on the main page), it will give you a good idea if you’re moving much too fast or way behind. Not that it matters — everyone heals at a different pace, but I still found it helpful to judge if I was pushing too hard. peterc’s AchillesBlog is proudly powered by WordPress and WPDesigner..